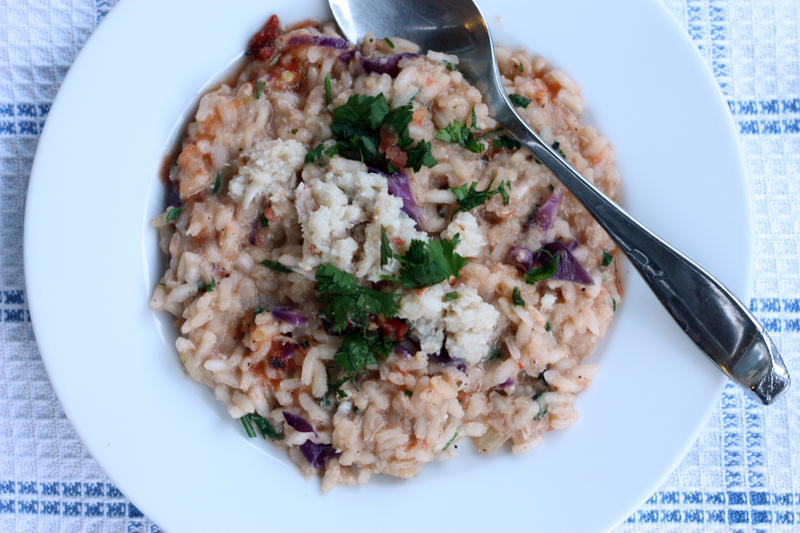 I’m not quite sure if I posted or coved risotto before, but it’s one of my favorites. Mainly because it’s flexible. I probably say that too much about food. I remember a couple weeks ago I was visiting my friend Sam at his place in San Francisco, and he was telling about a time he had risotto in Italy. It was calamari with black ink or something like that, and they way he described the texture and silkiness made me really want to make risotto, or at least teach him how I make risotto. I’ve never heard of that dish before, but hat’s off to it, it sounds amazing. First, combine clam juice and water in a pot and bring to a high simmer, just before boiling. In another pan on medium high, add olive oil to coat the bottom and sides. Add the rice, and cook while stirring with a wooden spoon constantly. Add olive oil if you think it’s a bit dry, we want the rice to move around well. Keep cooking and stirring until you see that the rice is semi translucent (with a some white in the middle). Now add the clam juice mixture, about a ladle. Stir rigorously until the water is almost gone; if you drag your spoon on the bottom, the rice should lag more than there’s less water. Repeat this maybe 5 more times, or until the rice seems half way cooked of the way cooked. When it’s at this point, add the wine and let it boil off the alcohol. Then add the salsa. Season the rice with salt and pepper to taste .Continue to ladle in the clam juice until the rice is al dente (take a taste). I like to keep the rice slightly al dente, so that the risotto is not a pile of mush. At this point, add your crab, and cabbage, and some of the cilantro. Season again. Keep mixing and tasting to see where you want your risotto, adding water like previous steps as necessary (longer= softer). Once it’s done, throw in cheese and a teaspoon or so of butter to finish. Stir it once last time, and it’s done! Garnish with the rest of the cilantro, and if you want some lemon juice. It’s up to you! Hope you enjoy this risotto, I know I did. I agree the layout is awesome! And the recipes – even better! This entry was posted on April 24, 2012 by rrfoods in Dinner, Lunch and tagged cilantro, crab, Dinner, lunch, rice, risotto, seafood, summer.